Sofia has a history that goes back thousands of years. Through the centuries many peoples have inhabited it and added to its rich and diverse history. The Thracian Serdi tribe settled here in the 7th century BC and gave the first recorded name of Sofia – Serdica. The Byzantines called it Triaditsa and the Slavs – Sredets. The modern city of Sofia was named in the 14th century after the basilica St. Sofia, which in Greek means wisdom. In the 3rd century AD, the Romans built strong walls around Serdica – the capital of their province Inner Dacia. A large part of the ancient city of Serdica is underneath important modern buildings. The ancient city council is hidden under the "Sheraton" hotel; a number of basilicas are below the National Historical Museum. The Roman thermal baths are under the Sofia Mineral Baths and a Roman residence with elaborate mosaics is below the "Rila" hotel. The Turks captured Sofia in 1382 and made it the centre of the Rumelian beylerbeyship. 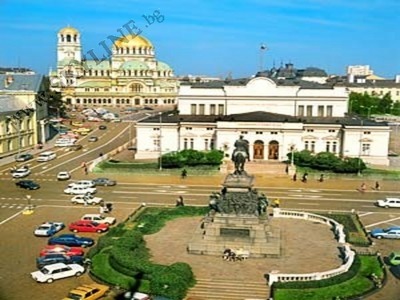 The city declined during the feudal unrest of the 19th century, but the establishment of the Third Bulgarian Empire in 1879, Sofia once again became the capital of Bulgaria. Rapidly the city's image changed from an Oriental to an European. Today many streets, buildings, parks preserve the architectural style from the turn of the century. Between 1879 and 1939 the population of Sofia grew from 20 000 to 300 000. Today it is 1 250 000 people. • ALEXANDER NEVSKI MEMORIAL CHURCH – completed in 1912 in honour of the Russian casualties of the 1877- 1878 War of Liberation from Ottoman Rule. Gold-domed, it is the finest piece of architecture in the Balkans. Craftsmen and artists from 6 countries worked on the five-aisle church in the course of 30 years and created real masterpieces of icons, frescoes, murals and huge chandeliers. A superb collection of icons – the best in Bulgaria – can also be seen in the Crypt. • ROTUNDA OF ST. GEORGE - A brick building from the 4th century in the courtyard behind the Sheraton Hotel, adorned with finely preserved early medieval frescoes. There are also remains of a C2 street and other Byzantine ruins. • ST. SOFIA CHURCH – The 4th-6th century basilica was built during the reign of Justinian. It has survived intact with 1600- year-old mosaic details and towards the end of the 14th century gave the city its name. • THE NATIONAL PALACE OF CULTURE – The biggest Congress Centre in the Balkans. It is located in the centre of the city and faces the Vitosha Mountain. • THE CHURCH OF ST. NEDELYA – Built in medieval times and known as the Church of the Blessed Sveti Kral. The current building was reconstructed after 1925 when it was almost completely destroyed by a bomb explosion. • SOFIA UNIVERSITY – The country's most prestigious university. It was built a decade after Sofia became Bulgaria's capital in 1879 with funds bequeathed by the brothers Evlogi and Christo Georgiev. • DRAGALEVTSI – A suburb in the woods at the foot of Mount Vitosha. About 3 km further on is DRAGALEVTSI MONASTERY, founded during the reign of King Ivan Alexander. Frescoes date back to the 15th century. • BOYANA – A suburb at the foot of Mount Vitosha, notable for the BOYANA CHURCH, built in the C11. Frescoes are claimed to be among the oldest and most interesting examples of East European Medieval art. Like Rila Monastery, the BOYANA CHURCH has been listed by UNESCO as a part of the world s cultural heritage. • MOUNT VITOSHA – It has become very much a part of Sofia owing to its accessibility by means of the cabin lifts at Knyazhevo and Simeonovo. Cherni Vrah, the highest point, gives wonderful views over the whole region. The winter ski-resort Aleko lies at 1868 m and the ski season lasts from early December until late spring. The beautiful scenery makes the whole area attractive throughout the year.